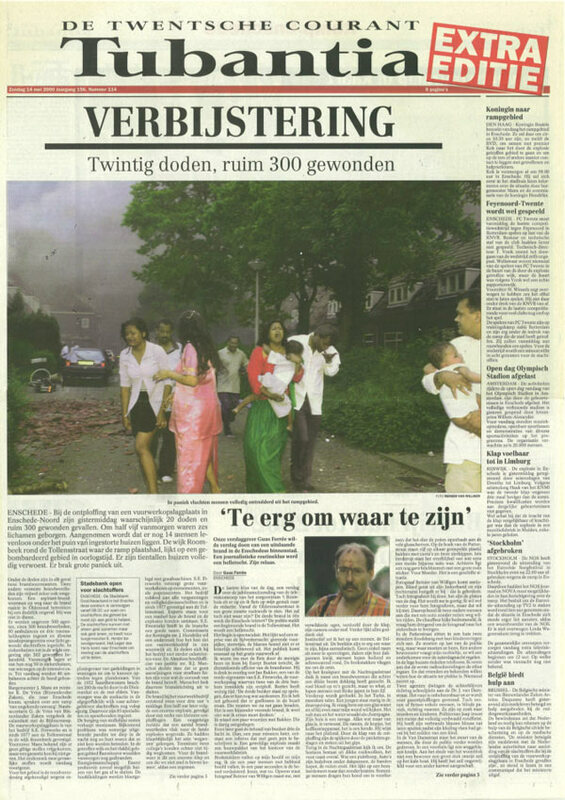 The Enschede fireworks disaster, also known as Vuurwerkramp (Dutch: literally, "fireworks disaster"), was caused by a fire which broke out in the SE Fireworks depot on May 13, 2000, in Enschede. The fire led to an enormous explosion that left 23 people dead, including four firefighters, and 947 injured. 400 houses were destroyed, 15 streets incinerated and 1500 buildings damaged. About 1,250 people were homeless, essentially obliterating the neighbourhood of Roombeek. The second and biggest blast had a strength in the order of 4000-5000 kg TNT and was felt up to 30 kilometres from the scene. A 40-hectare area around the centre was destroyd. About 1,500 homes were damaged or destroyed, leaving 1,250 people homeless. The damage was evetually estimated to exceed 1 bilion guilders, about 450 milion euros. Extra sunday issue of the Tubantia newspaper on May 14th. The fire started in the work area of the central warehouse where some 900 kg of fireworks were stored. The fire extended to two full containers that had been placed illegally outside of the building. Since the fire department could not contain the fire initially, it was able to spread to a third container, which exploded shortly afterwards. A chain reaction of explosions eventually led to the ignition of the firework bunker. An estimated 177 tons of fireworks exploded, virtually destroying the surrounding residential area. Dutch voting in the Eurovision Song Contest 2000 was suspended to free up phone lines for the emergency services, as a mark of respect and due to the fact that Dutch Television cut their transmission of the contest during it's running, to show Breaking News coverage. The cause of the fire has never been officially verified. One possibility was arson, with several arrests being made by the Dutch police but the fire department stated an electrical short circuit could not be totally ruled out. Another theory for the scale of the disaster was that workers had accidentally left open internal fire doors which might have contained the fire and subsequent blast. Theoretically such an explosion was considered highly unlikely because the fireworks were stored in bunkers specifically designed to minimize risk. However, the shipping containers were arranged closely together at ground level, not separated either by customary earth walls or any other form of partitioning and the doors were left open. In April 2002, the two managers of the company, Rudi Bakker and Willie Pater, were sentenced to six months' imprisonment for violation of environmental and safety regulations and dealing in illegal fireworks. Furthermore they were found guilty of an explosion with deadly consequences because of neglect. In February 2005 after a four-and-a-half-year legal battle, the six-month sentence of the owners was increased to twelve. In May 2002, André de Vries, who was accused of the arson, was sentenced to fifteen years' imprisonment but this decision was later overruled by a higher court and he was acquitted. The SE Fireworks disaster has led to intensified safety regulations in The Netherlands concerning storage and sale of fireworks. The area that was destroyed by the blast has since been rebuilt.